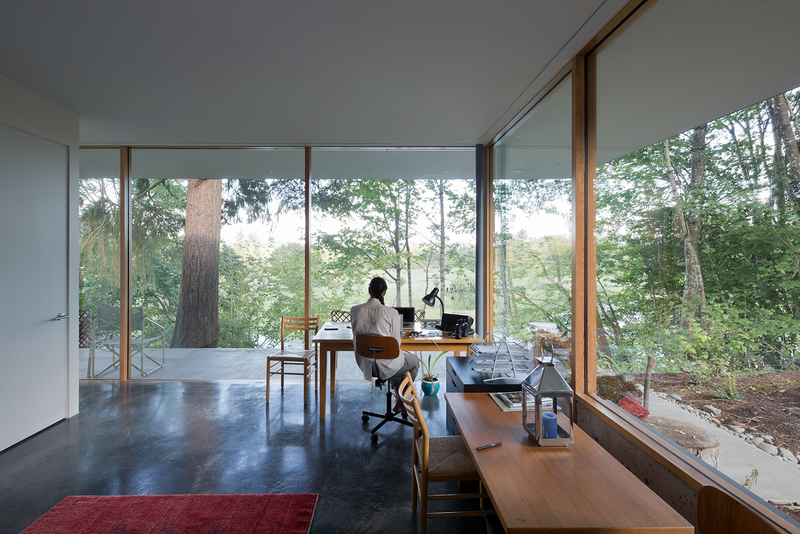 An architect creates a long-term home for his parents around a glass enclosure built to celebrate Northwestern wilderness. 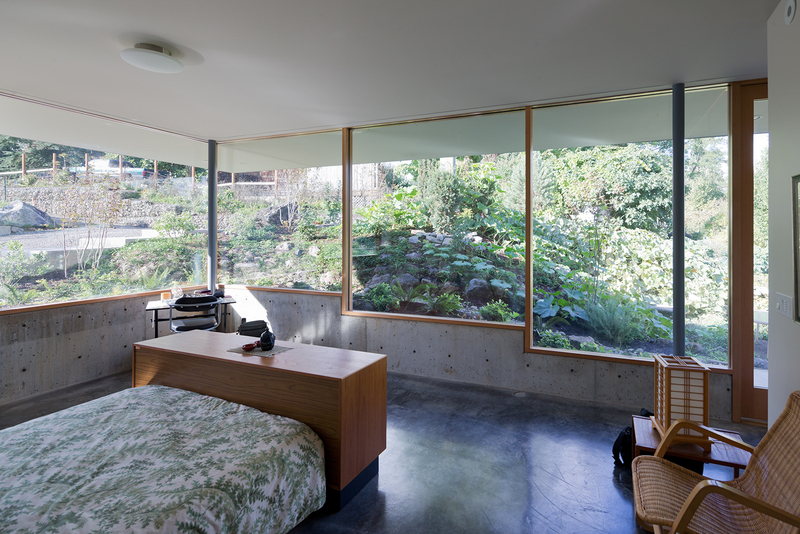 In the master bedroom, stepped windows framed by Douglas fir mullions rest on low concrete walls that are flush with the easy-to-maintain, hand-troweled concrete floor. The platform bed is from Scan Design and the rattan chair is from Ikea. The couple brought most of the house’s furnishings from their previous home, including the living room’s hand-knotted South Persian Gabbeh that belonged to Philip Heid, Ted’s father. Philip put in the pond, beyond, when he bought the property. Among the few new pieces the couple acquired for the house is a blue Bantam sofa from Design Within Reach, which complements the Westnofa Siesta chairs by Ingmar Relling in the living room. The kitchen includes a Jenn-Air refrigerator and a Bosch oven. “There are a lot of well-loved, well-used pieces that were destined for this house,” Andrea says of the couple’s furniture collection. They placed a solid alder Homestead table from Whittier Wood Furniture in the office, which also overlooks the pond. 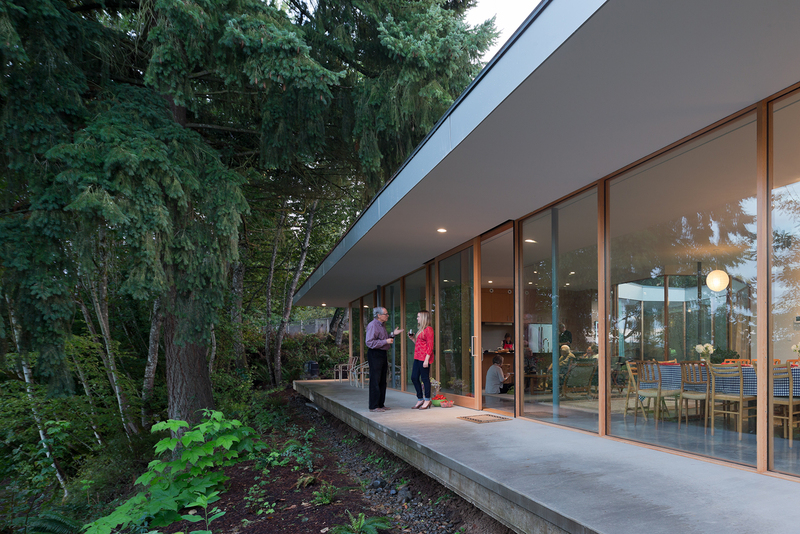 The driveway leads down a gentle slope to the garage, which is partially tucked into the earth, covered by a green roof, and fronted by a ramp leading to the entrance. 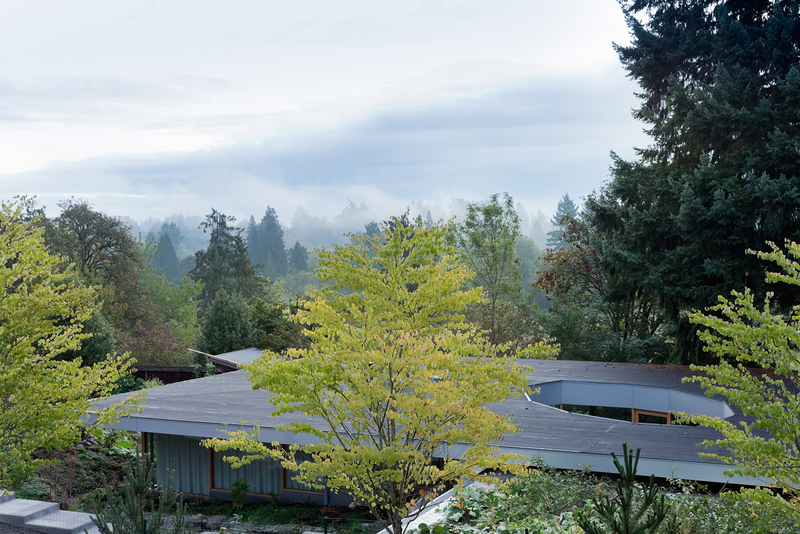 Alexander Prideaux of Aurora Landscape helped integrate the house with the site. Surrounded by a canopy of trees, the house is bordered by a deep overhang that matches the width of the concrete terrace. “What I like is that the decks and the courtyard are visually part of the house, but they’re outdoor spaces,” says Ted. Heid worked with Curtis Bosworth and John Weed of WBS Construction on the project. Though they were only on the verge of retirement, the couple embraced the prospect of aging in place. (Ted was an attorney, and Andrea worked for the University of Oregon.) They knew just the spot: a parcel adjacent to 25 acres that Ted’s late father, Philip, had bought nearly 20 years before in the historic town of Aurora, in the Willamette Valley. And they knew just the architect: their son, Andrew. A graduate of Princeton University’s School of Architecture who had worked for Rem Koolhaas’s OMA in New York and Rotterdam before launching his own practice, the New York City–based NOA, in 2009, Andrew is passionate about architecture’s ability to influence social interaction. He saw in the Aurora property the opportunity to create not just a suitable home for his parents, but a new typology. 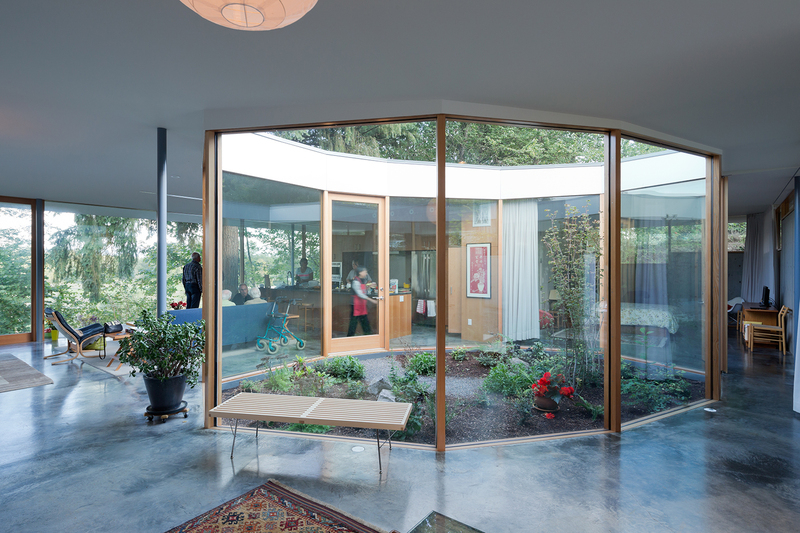 From the start, the intent was to create a home that would be easy to live in, easy to age in, and easy to maintain. Universal access was critical. In the kitchen, large drawers holding dishes and other utensils were placed within easy reach of the main sink and the dishwasher. In a nod to his mother, who stands five feet tall, Andrew reduced the height of the cooktop to 34 inches. “I can look inside the pots while I’m cooking,” she says.